Daily Commentary – Monday, May 21, 2012 – Can Rahm Emanuel Handle the Security Problems Caused by the NATO Summet Protesters? It would appear that Moammar Qaddafi’s days are numbered in Libya. Libyan rebels are saying that they have captured Qaddafi’s son in Tripoli and arrested him. Fox News is reporting that Libyan rebels are within two miles of the center of Tripoli. The recent battles to take Tripoli have killed up to 1300. Mohamad al Akari, a Transitional National Council advisor, said that if Moammar Gadhafi is still in Tripoli, they believe he is in Bab al Aziziya. “Tonight it’s over,” Akari said. Libyan rebel forces are now in Green Square in the heart of Tripoli, according to multiple reports. Earlier today, rebel forces pushed into the western outskirts of the Libyan capital without meeting any resistance. The rebels reached Janzour, a Tripoli suburb, around nightfall today and were greeted by civilians waving rebel flags. The BBC is reporting that Moammar Gadhafi has fled to Algeria, although not yet confirmed. More from the BBC on the rebels moving into Tripoli. Good riddance to bad rubbish, although let’s hope the end game and transition of power is not a complete mess in a post Qaddafi world. As Qaddafi’s regime crumbles this looks like it could really get out of control. I hardly think its safe for journalists to be there right now. UPDATE I: Live blogging updates at Aljazeera. UPDATE II: More at Sky News. The claims come as rebels make rapid advances into the centre of Tripoli, meeting scenes of jubilation and no resistance from Gaddafi’s troops along the way. Sky’s special correspondent Alex Crawford, accompanying the rebels, said as opposition fighters entered the city, their cars gridlocked the roads and hundreds of people came out onto the streets to greet them. The rebels responded with celebratory gunfire, she said. Saif al-Arab Gaddafi, the youngest son of Libyan leader Muammar Gaddafi was killed today in a NATO air strike.Also reported killed in the air strike was 3 grand children of Muammar Gaddafi. Colonel Muammar Gaddafi and his wife were in the house at the time; however, both were unharmed. Nato air strike in the Libyan capital, Tripoli, has killed the son of Colonel Muammar Gaddafi, a government spokesman has said. Colonel Gaddafi himself was in the large residential villa which was hit by the strike, the spokesman added, but was unharmed. His son Saif al-Arab was said to be killed, as well as three grandchildren. 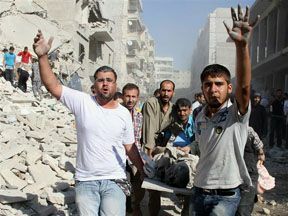 Nato said it had struck a “known command and control building in the Bab al-Azizya neighbourhood”. A Nato spokesman said that the air strikes were aimed at military targets not individuals.